If a warm, inviting, comfortable environment is what you are looking for - look no further than the New Norcia Hotel where the managers and staff are waiting to welcome you. Built in 1927 and nestled beneath gum trees on a rise overlooking the township, the Latin word Salve – Welcome – on the threshold tells you this is no ordinary country pub. 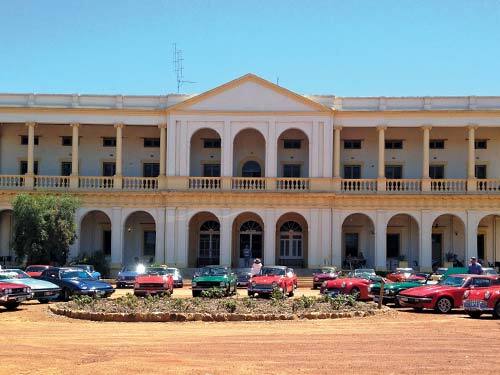 The New Norcia Hotel was originally a hostel for the parents of the boarders at the New Norcia colleges, but is now a practical expression of the Benedictine tradition of hospitality. Its grand neo-classical style will take your breath away as you approach the double front doors. It has fifteen comfortable rooms, a restaurant, huge verandahs, a bar and a deck for you to watch nature slip by as you sip on a glass of wine, beer or champagne from the popular New Norcia range. The menu is specially created by our head chef who sources all the food locally. At present there are two vacancies at the Hotel. The Hotel has launched a brand new menu come and try some of the delicious locally sourced produce. Please note there is a 15% surcharge on meals on public holidays.